Firstly, what is efflorescence? Efflorescence is salt deposits that moisture brings to the surface of masonry substrates. The moisture evaporates, leaving the white salty residue behind. This occurs especially on permeable concrete, stone and brick surfaces. There are several specialised efflorescence cleaning products that are currently on the market. However, the cleaning up can easily be achieved in some cases using normal household vinegar, or in more extreme cases using hydrochloric or phosphoric acid. If you are using an acid, it is first diluted with clean water before it is applied onto the contaminated surface. Firstly, pre-soak the surface to be treated with water. Once the area is wet, apply the vinegar or acid with a brush and let it rest for 5-10 minutes. You will notice the acid react with the efflorescence with some slight bubbling. After 10 minutes, thoroughly rinse off the acid from the affected area, and let the surface dry. A stiff bristle plastic brush is useful in wiping away any excess salts present in hard to reach edges and corners. 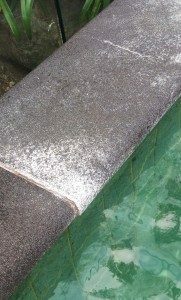 How to prevent efflorescence from occurring (again)? A good quality sealer is especially useful around pools and decks as it will not only keep efflorescence away but also will prevent natural stains. A higher-quality sealer can also repel oil and is extremely useful in barbecue/alfresco dining areas. It is also good household practice to make sure that other sources of moisture on masonry are eliminated such as leaking downpipes & roof guttering, and inadequate drainage.